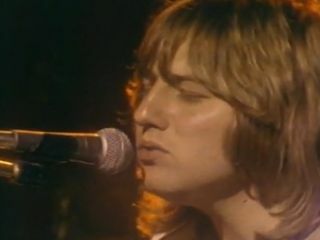 Greg Lake calls Emerson, Lake & Palmer - or ELP as the world knows the prog-rock trio - a "family." But did you know that family almost included guitar legend Jimi Hendrix? In an interview with London's Daily Mail, the members of ELP say that the idea was tossed around briefly. Keyboardist Keith Emerson's pre-ELP outfit, The Nice, toured with the Jimi Hendrix Experience in 1967. Experience and Band Of Gypsys drummer Mitch Mitchell suggested that Hendrix join up with the prog rockers when they were forming in 1970, but Hendrix balked at the idea. As it turns out, the feeling was mutual. "Quite honestly, I wasn't that interested," admits Emerson. "I had jammed with Jimi. He was so loud he'd have drowned me out." Bassist Greg Lake backs up the story, saying the fit would not have worked out. "Keith and Jimi both understood music brilliantly," Lake says, "but there would have been clashes. Plus, we'd have had to call ourselves HELP!" Emerson, Lake & Palmer will celebrate their 40th anniversary in London at Classic Rock Magazine's High Voltage Festival on 24-25 July. ZZ Top will co-headline the event, which will also feature Heaven & Hell's final concert, in memory of Ronnie James Dio.